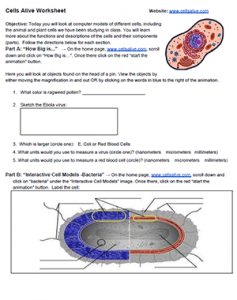 This worksheet follows diagrams and activities at CellsAlive.com which focuses on the size of cells compared to other objects, such as viruses and pollen. Students view interactive plant, animal, and bacteria cells to learn about the different structures associated with each. This worksheet can be used as reinforcement or review after students have learned the parts of the cell. I have also used it with students who may have missed a lab or other class activities. Most of the diagrams at cellsalive.com are interactive, requiring students to click and read text. The worksheet is filled out by reading and viewing the images. The reading level is fairly basic, and younger biology students should have no trouble with the text. Students also sketch organelles like the mitochondria and endoplasmic reticulum while the view the interactive plant and animal cells. Do check to make sure the interactives work on your computer network, some of the flash animation may not be compatible with all systems.